Jean-Isy de Botton (1989 - 1978) was born in Greece in 1898 to French parents. 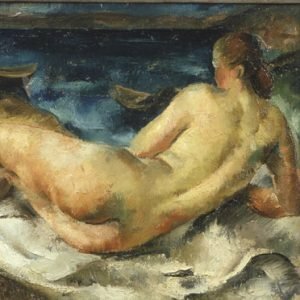 He studied Fine Arts at the Ecole des Beaux Arts in Paris and apprenticed in the studios of Antoine Bourdelle, a sculptor, and B. Naudin’s studio. After participating at the Salon d’Automne and the Salon des Tuileries from 1921 until 1933 where he found a certain success, he burned his work to start over and wrote a manifesto explaining his dislike of the chiaroscuro technique. It was a turning point for him as he wished to revisit painting through the research of colours. As a multi-disciplinary artist: painter, sculptor, drawer and writer, Botton was a prolific artist and quickly gained the favours of highly influent individuals such as, Her Royal Highness the Queen Elizabeth, Winston Churchill, Ernest Hemingway, Charlie Chaplin and the prominent American family, the Kennedy’s, amongst others. Most notably, he was appointed the officialpainter of Georges VI’s coronation in 1937. He has created several public artworks in France, the most famous being his painted fresco of the Palais de la Marine, created the same year as the coronation . When the WWII started, he moved to New York and travelled the United Sates for many years, becoming a US citizen. However he returned to Europe at the end of his life. His works can be seen in the public collections of the Albertina in Vienna, the Carnegie Institute in Pittsburgh, the Dallas Museum, the Fogg Art Museum in Harvard, the Metropolitan Museum of Art in New York, the Musée National d'Art Moderne in Paris, the Museum of Art in Atlanta, the Museum Richartz in Cologne, the Norton Museum in Palm Beach and the San Diego Museum.